Thin, light, with a nice display. Does this Windows Phone have all the right stuff? The Focus S goes head to head with any other WP7 phone on the market, and it does it in a thin, light, and sleek package. 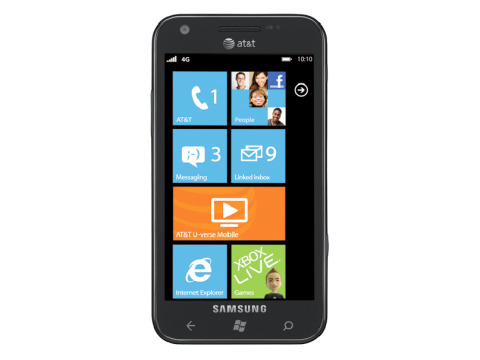 The Samsung Focus S is a Windows Phone 7 phone on AT&T intended to compete against relatively high-end devices. Its price tag – $199 with two-year agreement, and $549 without – suggests that it is to be pitted against phones like the HTC Titan, 16GB Apple iPhone 4S, and Samsung Galaxy S2. Compared to non-WP7 devices in its price range, the Focus S's hardware doesn't fare particularly well. Sporting a 1.4GHz (single core) Snapdragon processor and only 512MB of RAM, it strikes us as being about a year too late; however, amongst other WP7 phones, these specs are top notch. When it comes to WP7 devices, all of that internal hardware mumbo-jumbo is supposed to take a back seat. Microsoft has gone to great lengths to try to ensure that WP7 devices carry very uniform specs, letting you pick a device based on more outward criteria. The Focus S is all about size and weight. At just 8.5mm thick and 110.6g, it is the thinnest and lightest WP7 phone yet. Even more impressive is the fact that it manages this with a 4.3-inch capacitive touch screen with a 480x800 resolution. The display is another defining feature of the Focus S. Because it is Super AMOLED Plus, it has excellent contrast and the vivid color really makes the Metro UI pop. At 4.3 inches, it sits as an option between the HTC Titan (4.7 inches) and Samsung Focus Flash (3.7 inches), which both have nearly identical internal specs. It also features an 8MP rear camera with LED flash, typical of devices in this class, as well as a 1.3MP front facing camera. The usual assortment of sensors, light and proximity, are also present; however, we're disappointed in the lack of notification LED. The Focus S' camera does share an unfortunate design flaw that we see in many smartphones: it protrudes out from the back. This makes the lens prone to scratches anytime the phone is set down on its back. As far as build quality is concerned, the chassis is solid, though made of plastic, like most of Samsung's current smartphones. Point of concern is the battery cover, made of extremely thin but very resilient plastic. It clips on using a handful of tiny plastic hooks which may be susceptible to wear over time. Thanks to Microsoft's design standards, the Focus S has the same buttons found on any other WP7 device, though not necessarily in the same spots. On the face are the Back, Home (Windows Logo), and Search buttons in capacitive form. The left side of the phone holds the volume rocker. The Power/Lock button sits on the right side along with a very useful two-stage dedicated camera button. Along the top is the standard 3.5mm audio jack as well as a microphone for noise cancelling. On the bottom are the mini-USB port and another microphone. The loud speaker sits on the bottom corner of the rear of the phone. Under the back cover, we find the SIM card slot and a 1650mAh battery. Sadly, there is no expandable storage, so you're limited to the 16GB of internal storage – of which, about 12.6GB is available to the user. Despite its somewhat underwhelming specs on paper, the Focus S can serve as a worthwhile alternative to phones like the iPhone 4S or Galaxy S2, so long as you have the right purposes in mind.